This may come as a shock to you, dear readers, but I am not a fan of the sportsing events. The one exception being my lifelong love of the Minnesota Twins, but other than that, I have no interest in watching any game anywhere anytime. Except on the stage, where for some reason sports provides a good background for drama (see also Colossal and The Wolves, which is being remounted at the Southern beginning next week). In the case of Playwrights' Center affiliated writer Lauren Yee, basketball combined with US-China relations in the 1970s and '80s provides a whole lot of drama. 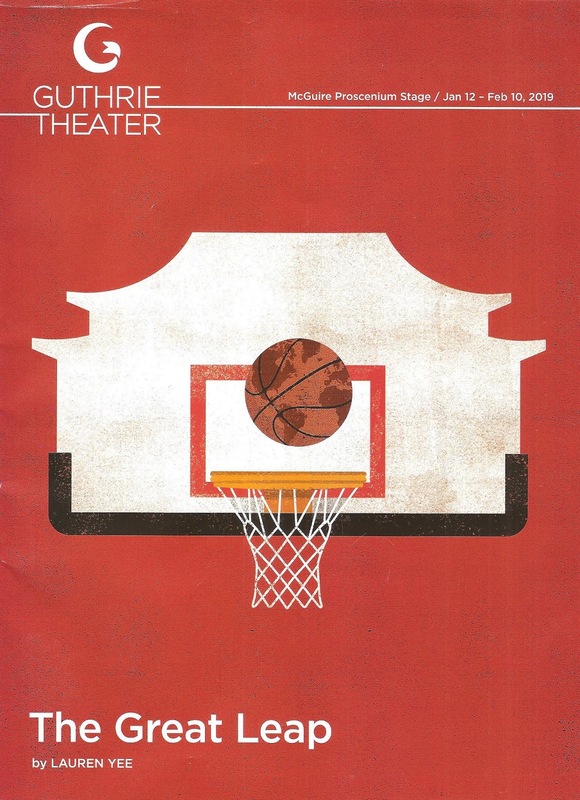 Inspired by her father, a Chinese-American who went to China to play basketball against Chinese teams, she has written a smart, funny, entertaining, educational, and thought-provoking play about basketball that isn't really about basketball at all. The Great Leap takes place in two time periods, 1971 China, and 1989 China and San Francisco. The title refers to the disastrous "Great Leap Forward" program by the Communist Party in China in the '50s. This is where I admit I don't know much about Chinese history, or present. There were some pretty significant events in 1989 that I vaguely recalled (I was in junior high at the time, and not the most globally aware). I had a sense of where the play was heading, and spent a fair amount of time reading up on Wiki after the show (this is the educational part). 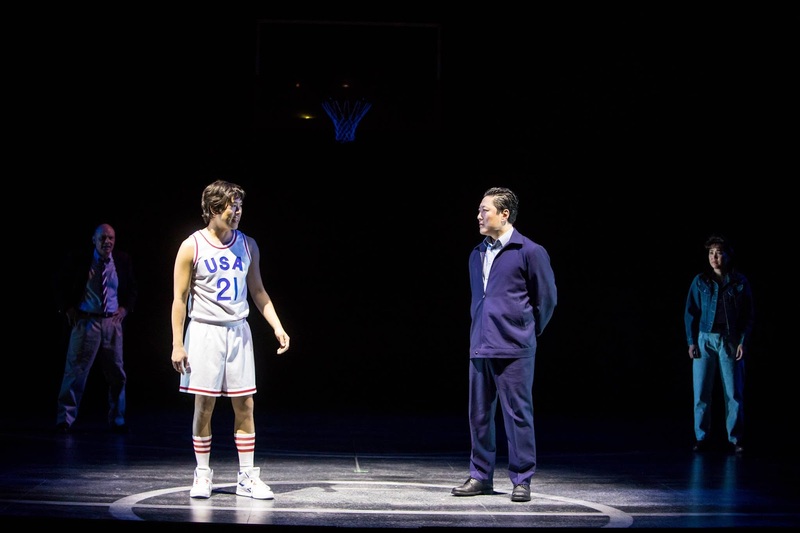 The playwright weaves all of this political and historical stuff into the story of a young Chinese-American basketball player and his coach, who claims to have taught Beijing the game of basketball and is headed there for a rematch. In 1971, Coach Saul taught basketball to some athletes at the University of Beijing, and is now, in 1989, taking his University of San Francisco team back to play in Beijing, a team now coached by his 1971 translator/protege Wen Chang. When Manford, a high school phenom from Chinatown, hears about this, he begs Saul to take him. Both Saul and Manford have their own reasons for wanting to go, the former related to his career and reputation, the latter to his family and identity. Manford's cousin/guardian Connie is reluctant to let him go, until she realizes what it means to him. "Four days in China in 1989, what could go wrong?" As it turns out, a lot, as the team gets caught up in the protests and political maneuverings. There's also a bit of a soap opera twist, but I love soap operas. I'm not sure how many players there are on a basketball team, but this excellent team of a cast has four members, who smoothly pass the ball to each other (see, I can do sports). Guthrie newcomer Lawrence Kao is full energy and charisma as Manford, while Lee Sellers epitomizes the tough-talking tough-love Coach. Local favorite Kurt Kwan brings depth and humanity to the role of Wen Chang, a much different man in 1989 than when we first meet him in 1971. Rounding out the cast is Leah Anderson as Connie, doing much with a small role. The team behind the scenes includes director Desdemona Chiang, smartly navigating the time changes and tone shifts from humor to deadly serious; scenic designer Sara Ryung Clement with a sparse set that easily moves between locations; projection designer Tom Mays with subtle touches throughout and a memorable final image; and costume designer Helen Huang - oh those high waisted stone washed jeans! 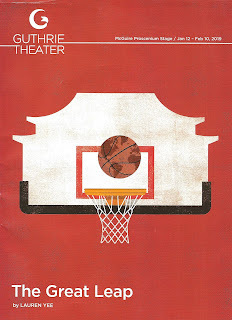 The Great Leap continues through February 10 on the Guthrie's Proscenium Stage. Go for the basketball, stay for the familial and political drama, with a generous dollop of humor and humanity (or vice versa).